Evripides Loukaides, also known as Evros, is interested in the mechanics of metal forming processes as part of the Flexible Metal Forming project. 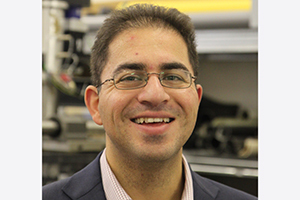 His work aims to characterise the mechanics of all future metal-forming processes, and, in collaboration with control engineers, to assess the limits of their closed-loop performance. Evripides gained his PhD in the Structures group at CUED with a focus on morphing shells. He completed his undergraduate work at MIT obtaining a BS in Civil Engineering and a Minor in Mathematics, and has an MS from Columbia University, also in Civil Engineering.